I have sensitive skin due to a Thyroid disorder. Therefore I do my best to use laundry products free of dyes and fragrances. And skincare products made with all natural ingredients. I also have extremely dry skin and need heavy duty moisturizers. Both shea butter and coconut oil moisturizes my skin well without breaking me out, or leaving me too greasy. 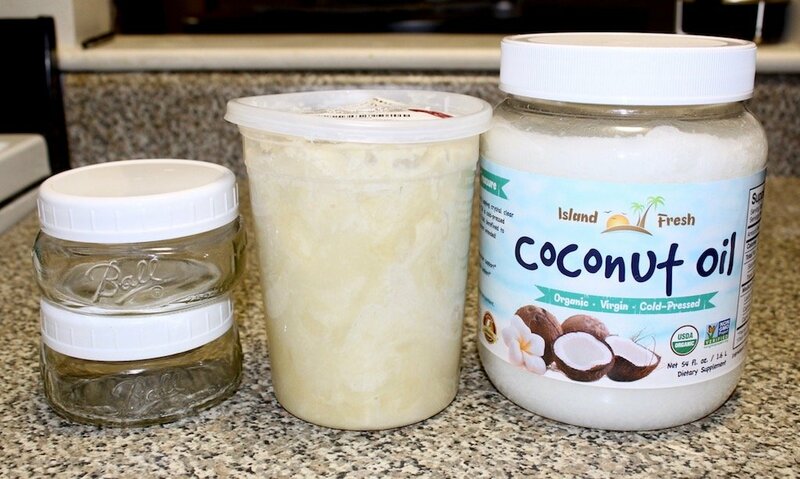 So I moisturize with this Homemade Whipped Shea Butter & Coconut Oil Body Butter. It’s so easy to make and leaves the skin feeling divine! The recipe for my Whipped Shea Butter & Coconut Oil Body Butter requires two simple ingredients, shea butter and coconut oil. You can add olive or jojoba oil for more moisturizing properties. And essential oils for other skincare benefits and fragrance. I prefer my body butter to have only a slight scent since I wear perfume and don’t want it to clash. So I simply use just shea butter and coconut oil. I actually love the scent. It’s light yet sweet, and slightly earthy. I start with 1 cup of shea butter and a 1/2 cup of coconut oil. 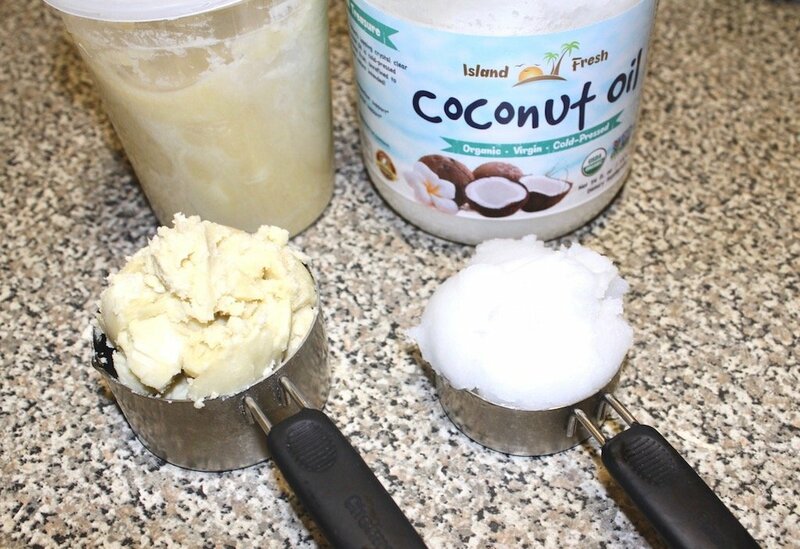 It’s easy to make a larger batch, just use half cup of coconut oil to every cup of shea butter used. To give you an idea of output, I used two cups of shea and one cup of coconut oil to fill 3 half pint mason jars, along with a 4 oz travel jar. 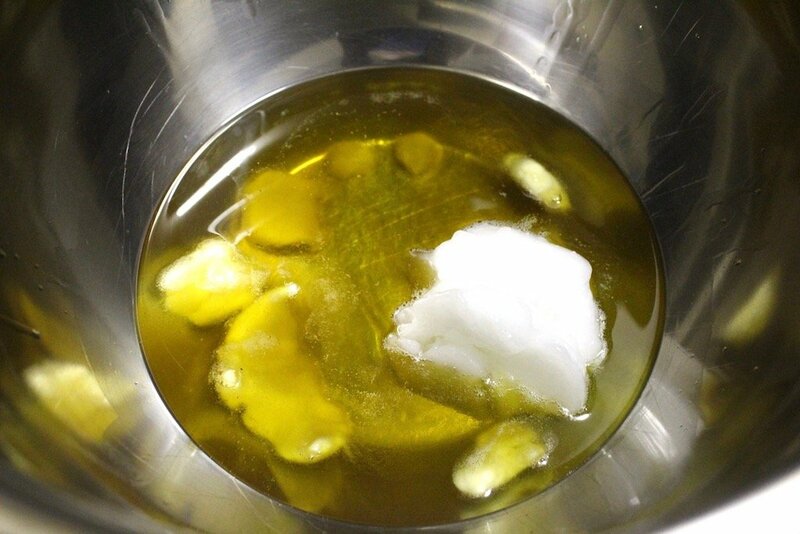 Making the body butter is easy. First bring a sauce pan of water to a boil. Put the shea butter and coconut oil in a stainless steel bowl, and sit the bowl inside of the boiling water. You may also use a double boiler. Stir until both the shea and coconut oil are completely melted and homogeneous. Remove the bowl from the bowling water (be careful, it’s hot) and set aside to cool until the oil mixture begins to solidify. You can sit the bowl in the fridge or freezer to speed up the process. Now it’s time to whip. I use a KitchenAid Hand Mixer on high speed to mix until the oils thicken a bit. Then I attach the whisk attachment to whip the mixture to the consistency of cake frosting. 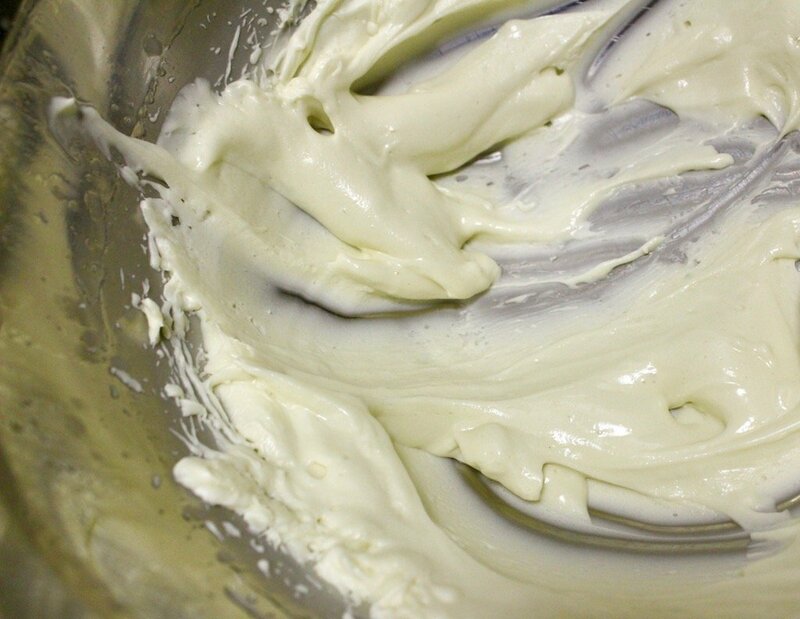 If you notice it’s taking your mixture a long time to get whipped, it’s not cool enough. You can sit the bowl in a bowl of ice water to cool further. 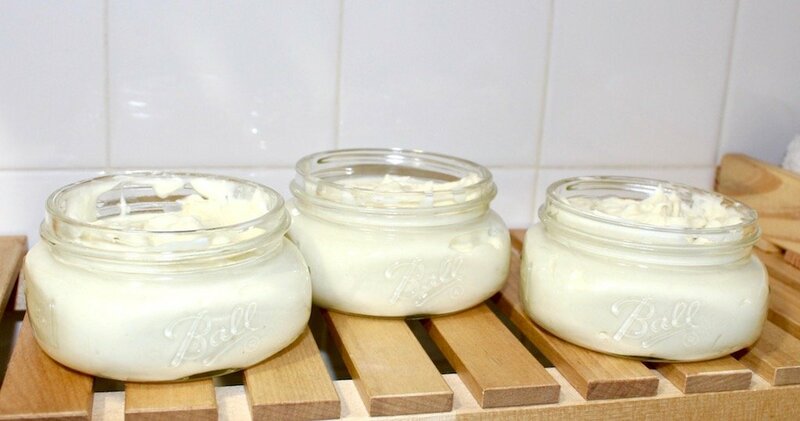 I store my Homemade Whipped Shea Butter & Coconut Oil Body Butter in these Ball Half Pint Mason Jars. I use the plastic lids instead of the original metal lids to make it easier to open and close. You can also glue the two pieces of the metal lid together. The body butter stays fresh at room temperature until used up. 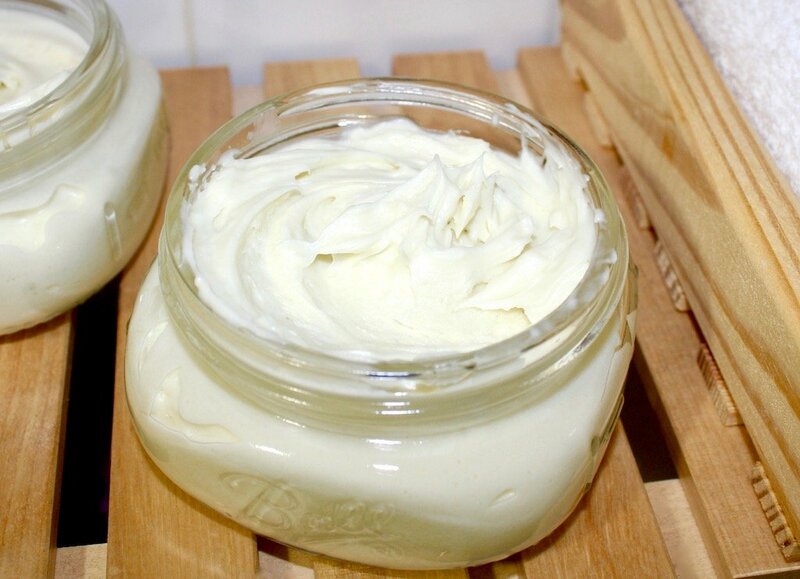 Mother’s Day is right around the corner, so be sure to make a few extra jars as this Whipped Shea Butter & Coconut Oil Body Butter will make great gifts. Just tie a pretty ribbon around the jar! Can I buy the Shea butter in stores? I see it in my local beauty supply store sometimes. If you have an African market near you I would check there! Everything is linked in the post. Pink text indicates the links.But you can use whatever shea butter you like, as long as it’s 100% raw.